Cooks need herbs. Since the media is filled with articles about the thriftiness of a vegetable garden in these difficult economic times it suddenly struck me that one of the thriftiest and easiest gardens to start is an herb garden. I get dizzy when I think of the money I spent (before I had an herb garden) on bunches of parsley, cilantro and basil and less common herbs that are even more expensive. Herb gardens are also easy to start. A utilitarian herb bed requires no design skills, just a sunny spot with soil that drains well. Most herbs will do fine in ordinary soil, although any plant is happy for a helping of compost. There is no need to spend money on fertilizers, and pests will be rare. Many herbs including rosemary, thyme, chives, French tarragon, marjoram, and sometimes sage, are perennials that will come back year after year. Last year my rosemary plant had gotten so big and unwieldy that I left it out in the garden when winter arrived. This year I will get a new small rosemary plant and put it in the herb bed, but pot it up and bring it indoors for the winter. Rosemary doesn’t mind a cool indoor room, but it needs to be kept watered to thrive. Mine was always happy when it was warm enough to leave its pot and live in the garden soil during the growing season. French tarragon is not supposed to be dependably hardy here in Heath, but mine has done well for several years. Many people manage to keep sage going for several years, but I find it iffy. I’m still waiting to see if mine has come through the winter. Chives increase in size and don’t mind frequents harvests. They are so pretty and useful for oniony flavoring and for a bright garnish. Plain old thyme is so hardy and vigorous that it has jumped into my lawn, and even the weedy field beyond. Once I realized that it had moved into the lawn, I took advantage of its adaptability and moved plugs of it out into dry weedy areas where it has taken over and spread, always green. Obviously I don’t demand a lawn of fine turf. A flowery mead is all I desire. Parsley, dill, cilantro, basil, caraway, and summer savory are all annual herbs, easily started from seed. Parsley benefits from being started indoors because it is so slow to germinate. Cilantro grows and goes to seed so quickly that it is wise to consider planting a small patch every two or three weeks during the season to provide a constant supply of fresh flavorful foliage. I look at recipes for grilling marinades and it is obvious that many of these herbs are essential for summer menus. Garlic is an important cooking herb. It needs to be planted in late fall. In the spring you can harvest the beautiful budded shoots called scapes, chop them and use them for garlic flavoring. You will still be able to harvest the mature garlic bulbs in mid summer. However, at the Western Mass Master Gardeners Spring Symposium I learned from Denise Lemay of Stockbridge Herbs in South Deerfield, that there is a fashionable trend for planting garlic cloves in the spring garden and harvesting the fine shoots to use in the kitchen for their gentle garlic flavor. Lemay also warned that although fresh peeled garlic can be preserved in vinegar, it should never ever be preserved in olive oil where it will quickly ferment and produce the botulism toxin. Shortly afterwards, I met a woman who told me she had been given a jar of garlic in oil but it began to bubble. She thought it looked dangerous and threw it away. Smart woman. There are ways to lower the costs of an herb garden, or any new garden. First, you can share your seeds. A whole packet of seed is often too much for a single garden. This year my neighbor and I coordinated our seed order so that we can share seeds. One packet each of summer squash, zucchini, and Waltham butternut is more than enough for our two small families. We went through the whole list looking for this kind of economy. There are other seed swaps, locally and on line. 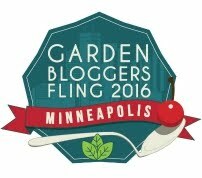 The National Garden Association has a seed swap page on their website, www.garden.org. You can buy all kinds of seed starting equipment, but much of it can be made from recycled plastic mushroom or other produce boxes, and egg cartons. Two caveats. If you are going to use plastic boxes remember to punch drainage holes in the bottom. If you use egg cartons remember to keep the cardboard damp, just as you would for peat pots. The easiest way to keep any seed box properly watered is to put it in a tray that will hold some water. Osmosis will bring the water into the soil. This is especially important for the cardboard egg cartons that should be kept damp. Next week I’ll talk about preserving herbs. Drying and freezing your own herbs will increase the amount of money you save by preserving your herbs for winter use. Right now I am enjoying the signs of new growth in my own herb bed. 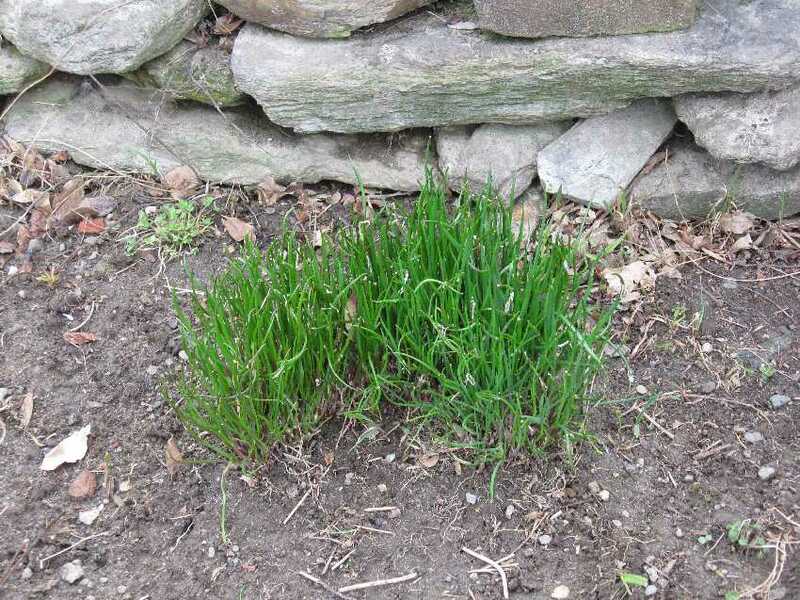 April has just begun but the chives are ready to use. Hi Pat, an herg garden is a brilliant choice for both saving money and having beauty in the garden. The plants grow so well with so little effort. Even the perennial ones can be replaced cheaply after they get too overgrown for the space. You and I are of one mind. And there are always herb plants to share at swaps and sales.